Not what I would consider a great day, but regardless, I got some work done in the end. 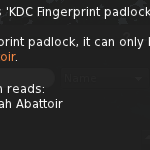 I rewrote all the padlocks and did memory profiling on them. 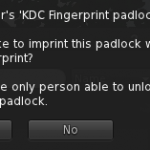 I redid all the pop-up messages,( especially for the fingerprint padlock) in the hope that it will make things clearer for new users of the system. I also tweaked the time padlock so it doesn’t have those weird “3:55” limits, now it will go all the way to “4:00”, but the lower limit will still be 5 minutes. I also figured out the source of conflict between leg animations and suspensions, will be fixed soon.